The writers were unaware that there was a cartoon about the Harlem Globetrotters in space. They made up their own globetrotter names as they couldn't use actual globetrotters, the actual trotters okayed the use of their group's name. Travelling forwards in time can't result in causality problems. John DiMaggio wanted to play Marv Albert, but lost out to Jeff Cesario. Grotrian is a type of piano. Armo is the arm mutant, Lazar is the optic blast mutant; these two names aren't in the actual episode. Network executives always ask what the stakes are when they get a script, so the episode starts by setting the stakes at zero. Censors made them adjust the conga line to hide more cleavage. No objection to the seven buttockses. 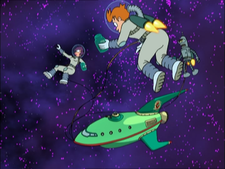 They also rejected the word "mutha", which became "mama"
The original story, involving Fry falling in love with a woman in a Sun, and having to move it, was derived from a Harry Stephen Keeler novel. Ken Keeler: I should say at this point that I really know virtually nothing about basketball. David X. Cohen: You would never know it. I mean this is pretty accurate stuff here. This page was last edited on 5 May 2010, at 01:13.